Self contained unit with HEPA filters, blowers, motors and prefilters. May be aligned to form a filter wall to any specs. Fabricated in 3,4,5,6ft widths. FM500 Filter Modules simplify design and construction of Horizontal flow Class 100 areas. 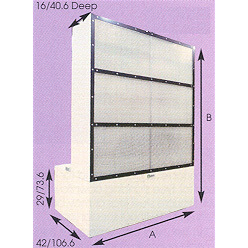 A self-contained unit with HEPA filters. blowers, motors and prefilters. May be aligned to form a filter wall to any specifications. Modules fabricated in 3ft, 4ft, 5ft, and 6ft widths. Units can be set up side by side. Features » 3/4-inch novaply, white high pressure plastic laminate on exterior. » Interior surfaces sealed to prevent shedding particulates. » Also available in 16ga cold rolled steel, painted white. » Dust Guard 1" prefilters, 30% efficient NBS mounted in blower compartment. » Final filters HEPA type 99.99% efficient 0.3 microns and larger.